Dental caries is a common disease caused by oral bacteria. Streptococcus mutans and Streptococcus sobrinus are the primary cariogenic microbes that often survive as biofilms on teeth. In a recent study, we the research group led by Prof. WEI Hongping in Wuhan Institute of Virology of the Chinese Academy of Sciences evaluated the activity of ClyR, a well-known chimeric lysin with extended streptococcal host range, against common Gram-positive oral microbes and its anticaries efficacy in rat models. ClyR demonstrated high lytic activity against S. mutans MT8148 and S. sobrinus ATCC6715, with minor activity against Streptococcus sanguinis, Streptococcus oralis, and Streptococcus salivarius, which are considered as harmless commensal oral bacteria. Confocal laser scanning microscopy showed that the number of viable cells in 72-h aged S. mutans and S. sobrinus biofilms are significantly (p < 0.05) decreased after treatment with 50 μg/mL ClyR for 5 min. 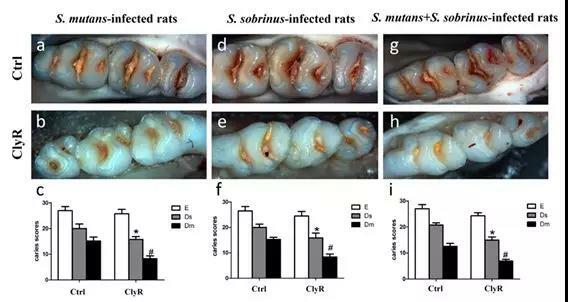 Furthermore, continuous administration of ClyR for 40 days (5 μg/day) significantly (p < 0.05) reduced the severity of caries in rat models infected with a single or a mixed bacteria of S. mutans and S. sobrinus. Therefore, ClyR could be a promising agent or additive for the prevention and treatment of dental caries. The results have been published in viruses entitled "Activity of the Chimeric Lysin ClyR against Common Gram-Positive Oral Microbes and Its Anticaries Efficacy in Rat Models". This work was supported by the National Natural Science Foundation of China and Chinese Academy of Sciences.